This study takes as the focus of its analysis the influence of geo-political relations on humanitarian interventions in a conflict situation; in this case the Gaza Strip. Two main determinants that inform UNRWA’s humanitarian work emerge from the analysis of its work with Palestinian refugees in the Strip. The first one is the geopolitical relations that influence the flow and priorities of aid by formulating specific policies and intervention schemas based on emergency strategies rather than finding long-term solution. The second factor is the nature and the privileges that organization enjoys as sole actor in charge of satisfying these needs. Bureaucratic dysfunction leads to disregarding of feedback from recipients and therefore the perception of beneficiaries not taken into consideration through a continuing process of reform as a result of budget cuts. 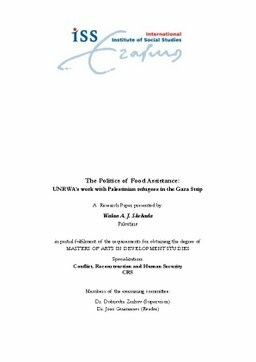 Reflecting on the literature debates surrounding humanitarian aid, and especially those around neutrality, independence, impartiality and humanity, the paper concludes that humanitarian interventions have a very limited impact on the well-being of aid recipients when they are stripped from the main principles that should guide humanitarian work. In this case, the deviation of humanitarian assistance away from the humanitarian imperative is due to the politicization of aid. Understanding how geo-political relations impact on humanitarian assistance in the Strip is an essential step for the humanitarian actors if they are to avoid becoming part of the larger geo-political agenda.